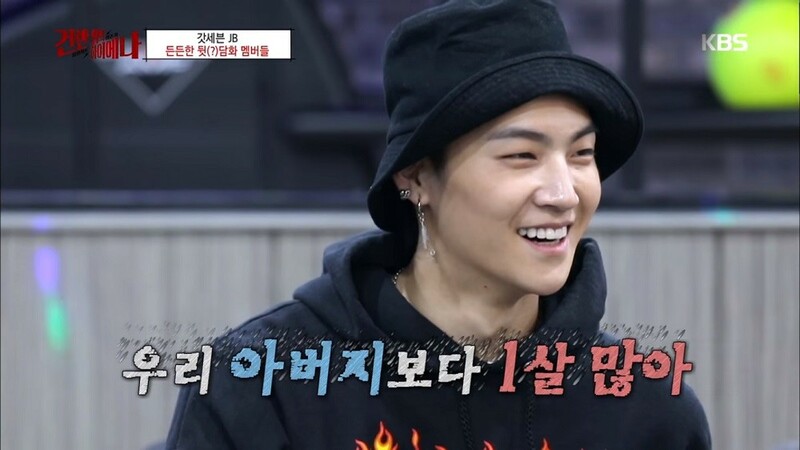 GOT7's JB says it feels strange to casually call�J.Y. Park 'hyung', because of his age! When Yugyeom commented that J.Y. Park is "very innocent", JB noted that J.Y. Park PD-nim would find that remark really funny, since J.Y. Park is 25 years older than Yugyeom. As they started talking about age, JB then said that it feels strange to call J.Y. Park 'hyung', since there is a huge age gap between them. "[J.Y. Park] is a year older than my father," said JB. Hearing this, both Youngjae and Yugyeom burst into laughter, and MC Jung Jae Hyung said he almost choked on his tomato. JB is currently working on his new song "Rainy", so he also asked his members advice on how to persuade J.Y. Park to like the track. They mostly thought about giving him his favorite food like sushi, but Youngjae suddenly mentioned that J.Y. Park is really into jade these days. "You should buy him a jade belt...or a jade bracelet," laughed Youngjae. Then JB responded,�"No...I'm afraid jade is too expensive for me. "�Click here to watch the full video of the conversation from this week's 'Hyenas on the Keyboard'!